You've seen how the Ip Man Movies have helped to spark the growth of Wing Chun Kung Fu worldwide. Now in this Wing Chun Video you will see a demonstration of 18 San Sik / 十八散式 / Separate Hands of HKB Eng Chun [Black Flag Wing Chun], also known as Cap Pwee Lo Han Jiu Suan Sik /十八罗汉手散式 [18 Lohan Separate Hands]. In this Wing Chun demonstration video, Grand Master Kenneth Lin demonstrates the execution of each San Sik / Separate Hand along with first degree Shock Impulse power known as Hoat Keng / 發勁 [aka Fa jin or Faat Ging]. 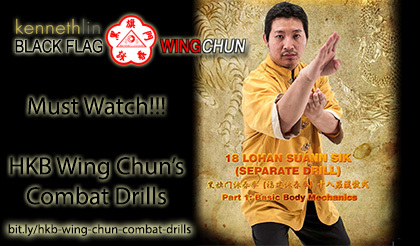 Although there are some similarity of Kulo Wing Chun 22 San Sik [Leung Jan Wing Chun Gu Lao 22 Points] as it indicates a possible similarity/connection but for sure, Black Flag Wing Chun 18 San Sik / 18 Separate Hands has it's own unique character, especially on the strong emphasizes on internal power of first degree shock impulse power.